Liverpool stepping up interest in Lyon star? 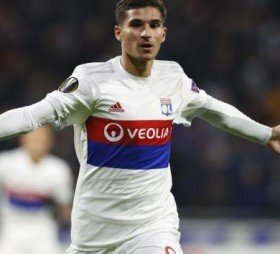 Premier League giants Liverpool could reportedly offer stiff competition to Manchester City in the race to sign Houssem Aouar from Ligue 1 side Lyon. The 20-year-old has established himself as a regular with Les Gones in a short period of time and he has already contributed five goals and four assists during the ongoing campaign. Amidst this, Citizens boss Pep Guardiola has already admitted that he is a huge admirer of the midfielder's talents but according to Telefoot, the Reds have joined the list of admirers for the Frenchman's signature. Aouar has already shown his versatility by featuring for Les Gones in different attacking positions but he has generally plyed his trade in central midfield, which remains an area which City may strengthen. Nonetheless, Jurgen Klopp's side have already shown their spending might with big-money moves for Virgil van Dijk, Naby Keita among others and they could potentially seek to land the Frenchman to enhance their title ambitions. Liverpool secured a rather fortuitous 1-0 win over Everton in the Merseyside derby over the weekend and this has helped them maintain their two-point gap to table-toppers Manchester City.